Appropriate business attire is required. Please note: casual attire, including T-shirts, shorts, jeans or flip flops are not allowed. Our courtrooms are generally very cool and you may wish to bring a sweater or light jacket. Since you will be passing through a metal detector, please leave excess metal and jewelry at home to speed up your entry into the building. In addition, please note that jurors may not bring weapons of any kind or electronic devices of any kind into the courthouse, including but not limited to: cell phones, radios, PDA's, tape recorders, computers, cameras and portable music players. Jurors should give close attention to the testimony. They are sworn to disregard their prejudices and follow the court's instructions. They must render a verdict according to their best judgment. Each juror should keep an open mind. Human experience shows that, once persons come to a preliminary conclusion as to a set of facts, they hesitate to change their views. Therefore, it is wise for jurors not to even attempt to make up their mind on the facts of a case until all the evidence has been presented to them, and they have been instructed on the law applicable to the case. Similarly, jurors must not discuss the case even among themselves until it is finally concluded. Jurors must not talk about the case with others not on the jury, even their spouses or families, and must not read about the case in the newspapers. They should avoid radio and television broadcasts that might mention the case. The jury's verdict must be based on nothing else but the evidence and law presented to them in court. Jurors should not loiter in the corridors or vestibules of the courthouse. Embarrassing contacts may occur there with persons interested in the case. Juror identification badges will be provided, and they should be worn in the courthouse at all times. 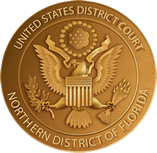 Tell the person it is improper for a juror to discuss the case or receive any information except in the courtroom. Report the incident at once to the judge. Jurors on a case should refrain from talking on any subject--even if it is not related to the matter being tried - with any lawyer, witness, or party in the case. Such contact may make a new trial necessary. In this district, jurors elect a foreperson. The foreperson presides over the jury's deliberations and must give every juror a fair opportunity to express his or her views. Jurors must enter deliberation with open minds. They should freely exchange views. They should not hesitate to change their opinions if the deliberations have convinced them they were wrong initially. However, a juror should never change his or her mind merely because others disagree or just to finish the trial. In a criminal case all jurors must agree on the verdict. This is also required in a civil case, unless the jury is otherwise instructed by the court. The jurors have a duty to give full consideration to the opinion of their fellow jurors. They have an obligation to reach a verdict whenever possible. However, no juror is required to give up any opinion which he or she is convinced is correct. The members of the jury are sworn to pass judgment on the facts in a particular case. They have no concern beyond that case. They violate their oath if they render their decision on the basis of the effect their verdict may have on other situations. After the jurors return their verdict and are dismissed by the judge, they are free to go about their normal affairs. Jurors are under no obligation to speak to any person about the case and may refuse all requests for interviews or comments. Payment to jurors for their service will be sent to them by mail within two weeks of their service.